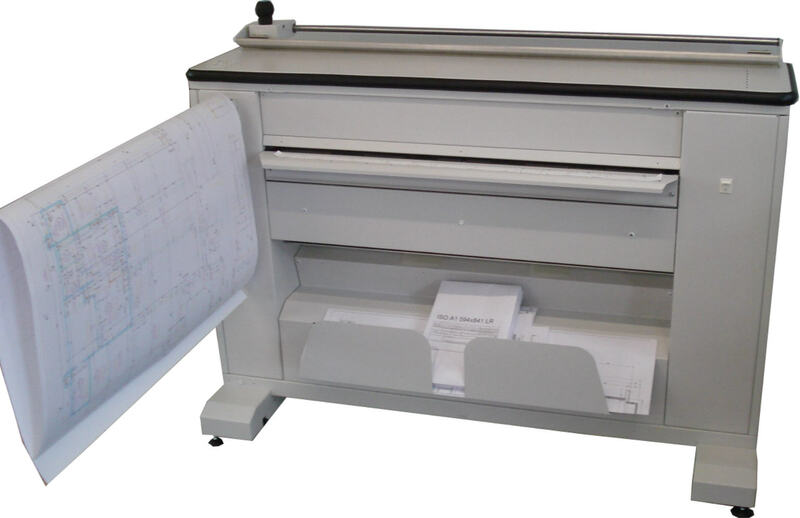 The Butterfly folder Cut & Fold has been realized in order to optimize the user’s work that must trim and fold large format copies. The trimmer is placed on the folder, the product can be placed against a wall, occupying an area less than one square meter. Together the trimmer and folder enable user to trim while another copy is folded. The copy must be trimmed only on the short table side since after the longitudinal folding, is possible to trim the pack eliminating all the white part of the two long sides with a cut of only 21 cm. The user, not having to move continuously from trimmer to folder, optimise the working time. The patent utility model provides also an intelligent logic that assures the well introduction of the copy also without of long guide of a table. Japanese motors superior quality, super silent, 150W powerful make the folder quiet only 58 decibels, reliable and durable. Look at the video to see the extremely practical and easy of use for the Cut Folder that allows to fold and cut always remaining in the same position optimizing space and working time; large sizes are also folded firstly in fan folding then in cross folding by re-introducing the copy.